We've just returned from our trip to Portugal, which included a 4 night stay at D_Loft apartments in Albufeira. We had a lovely time and really enjoyed the apartment and its location. Check in with Ines was a breeze. She is very kind and showed us around the apartment, including the rooftop terrace with jacuzzi. So nice to have fresh fruit and tarts, plus wine, beer and water in the fridge upon our arrival. Nice touch. The apartment was spotless and matches the photos shown on Booking.com. The location was perfect. We strolled into town several times a day and enjoyed the many restaurants and bars close to our building, yet the apartment was quiet during the night. Loved the electric shades in the rooms. Overall, we loved our stay and would definitely recommend this apartment for travelers visiting Albufeira. You will not be disappointed. Layout of flat, great wifi and tv channels, great kitchen layout and washing and drier machines and hot tub was so good. Lovely staff who were easy to get in touch with regarding locating the apartment and getting us checked in as soon as possible. Immaculate interior, comfy bed, nice extras like beers and baked goods on arrival. Brilliant roof top view of the town and sea in the distance with the luxury of a hot tub to relax in. Will definitely be coming again for a longer visit. Thank you! 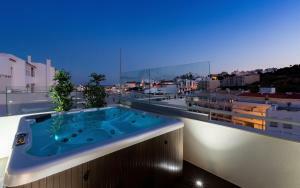 We love the Jacuzzi on the rooftop !! The flat was perfect !!! The apartment is modern and spacious, with all facilities required. While some days were not scorching, the hot tub on the roof made up for this and the sheltered sun beds, meant even if the the sun isn't shining this is a great spot to spend the day and night time. With wi-if and at the moment Netflix our teenagers also got the most out of it. A beautiful, easy place to stay. Perfectly situated for the old town, moments away from the big square but lovely and quiet in the bedroom when it can be lively in the street. It is great to people watch from the balcony, enjoy a drink and listen to the live music. 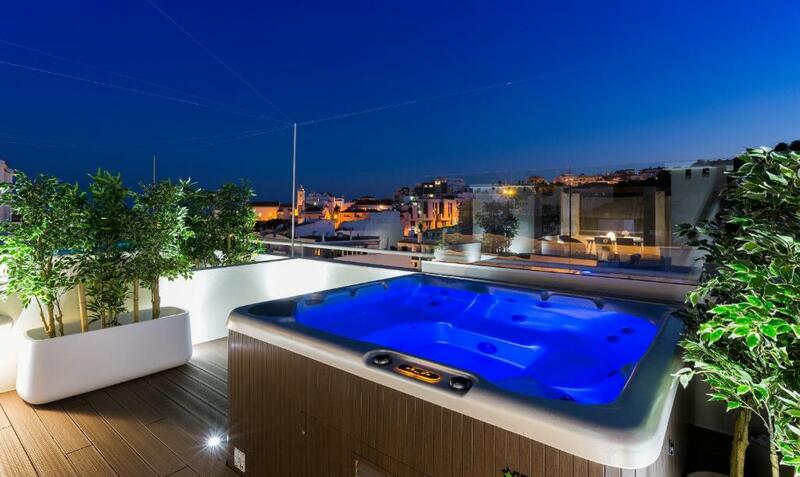 The roof top terrace is lovely and the hot tub makes you feel very lucky. The two bathrooms and kitchen are modern, well equipped and spotlessly clean. The living area is huge but we spent all our time outside. We really appreciated the warm welcome, arrival treats and ease of check-out. The c19 restaurant just up the street on the way to the Spar supermarket and the local bus stop is very good. The air con, washing machine, dishwasher, nespresso coffee machine and juicer make for a comfortable easy stay. The arranged taxi transfer to and from the airport was very good and reliable. WOW! What an experience! So glad we booked this gem only 1 minute away from the old town of Albufeira! The apartment is stunning (better than a 5 star hotel) and the rooftop with the jacuzzi really made the whole stay even more unique! Thank you! Lock in a great price for D_Loft Downtown – rated 9.8 by recent guests! 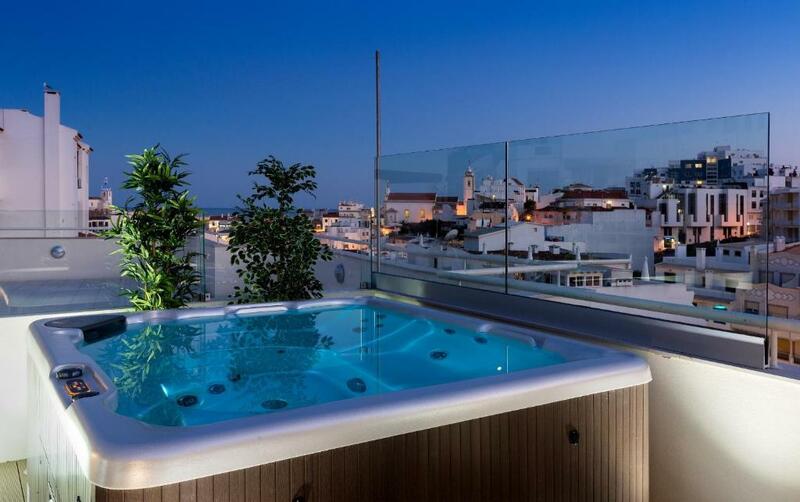 Located 1,000 feet from Old Town Square, the modernly-decorated DLoft Downtown offers accommodations in Albufeira. The property features views of the sea and is 1,950 feet from Fisherman's Beach. The kitchen is fully-equipped with all the appliances needed to prepare meals. A flat-screen Smart TV with satellite channels is provided, as well as a bluetooth speaker. The bedroom has a king-size bed, air conditioning and a flat-screen satellite TV. Other facilities at DLoft Downtown include 2 terraces. 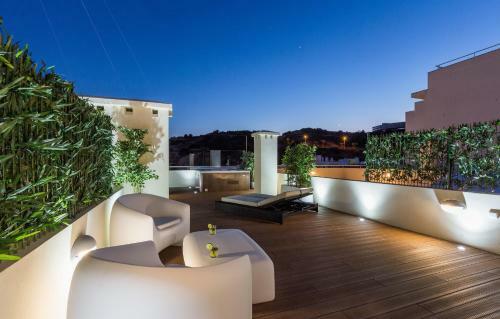 One of the terraces has a dining area, while the other is a top-floor private terrace, with modern furnishings, sun exposure, deck floor and a private hot tub. Albufeira Marina is 0.8 mi from DLoft Downtown, while The Strip - Albufeira is 1.5 mi from the property. The nearest airport is Faro Airport, 17 mi from the property. 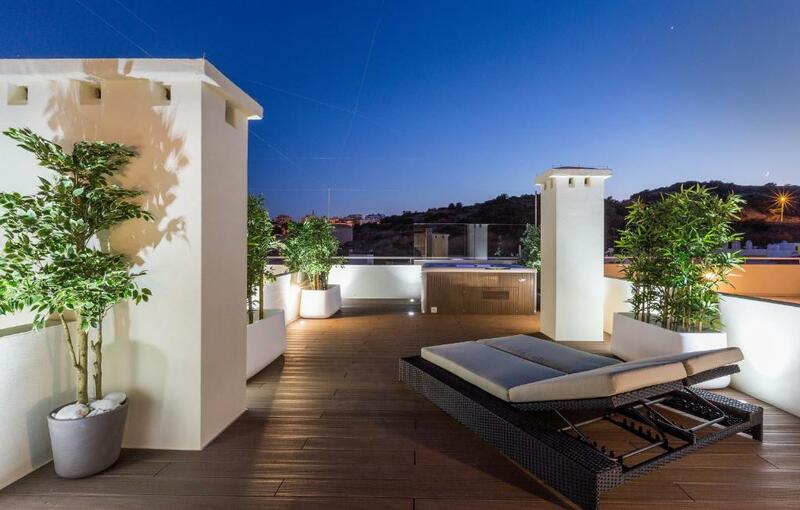 뀐 Located in the real heart of Albufeira, this property has an excellent location score of 9.9! When would you like to stay at D_Loft Downtown? This apartment has a bluetooth speaker, oven and balcony. This apartment features a dining area, air conditioning and a bluetooth speaker. We are a couple who really enjoys to travel. Since we decided to increase our family, that doesn't happen much, once we were blessed with twin girls that are now one year old. We don't rent apartments professionally, but basically as a hobby. We are located in the center of the old town (priv parking). In 3 minutes walking you are in the beach, and just coming out the main door you are in the center of life! But, don't worry, our Jacuzzi is on the 7th floor, so absolutely no noise there! House Rules D_Loft Downtown takes special requests – add in the next step! Please note that interior access to the rooftop terrace is via staircase and may be difficult for people with limited mobility. Outdoor access is available. Please note that late check-in after 20:00 has a surcharge of EUR 15 payable in cash at arrival. Please inform D_Loft Downtown of your expected arrival time in advance. You can use the Special Requests box when booking, or contact the property directly using the contact details in your confirmation. Getting to the roof top terrace was via a spiral staircase which was a bit difficult. The hot tub and roof top were great. - to get to the hot tub there is a very narrow and tight metal spiral staircase which is fine if your trim and able bodied (and sober) otherwise you really did need to tread with caution and mind your head. I can’t imagine anyone who’s ‘getting on a bit’ being able to access the roof terrace and hot tub easily at all - possibly some spare bathroom towels would be nice, and possibly a mattress topper as we found the mattresses a little hard (nothing major and just personal taste) and didn’t stop us from sleeping on the whole. there was plenty of spare pillows available. There was nothing I disliked. Everything was great. A small parking. Even if you can park your car, you need to be careful because it is tight !! Should have mirror in master room! Wonderfull apartment furnished with everything you need. Strongly recommended. A wonderful place and just as described at booking.com. The apartment is perfectly placed near shops, bars and restaurants. The beach is within walking distance. 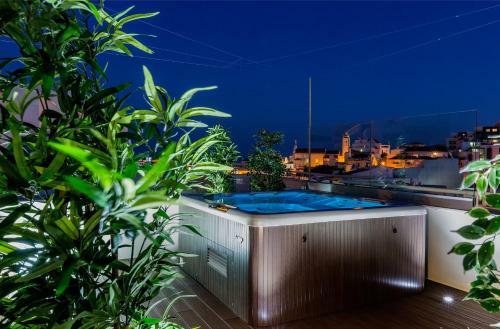 The terrasse on the roof is fantastic with sunbeds and a hot tub. All you need to feel as home is provided in the apartment. We where warmly welcomed by Inēs and that made a perfect start for our stay. We will definitely return to this wonderful place for our next visit. The only thing we found was going up and down the spiral stairs to the roof terrace a bit tricky but there is an alternative way to reach roof terrace. We loved all of our stay. Accommodation, facilities and locality. 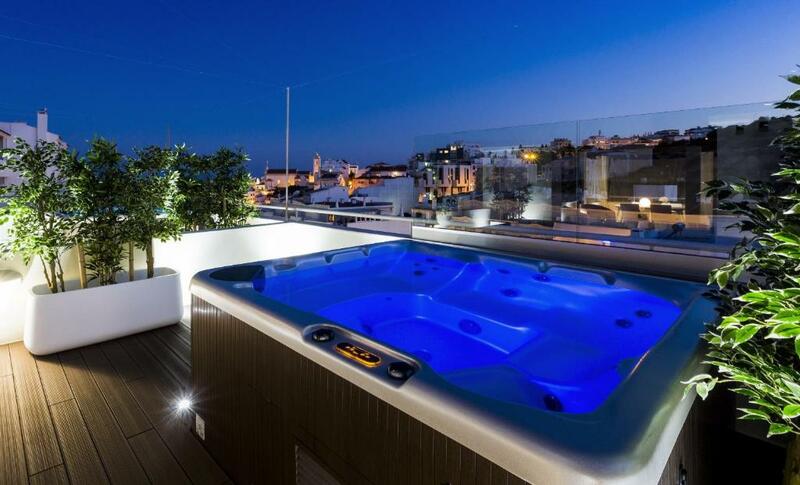 Roof terrace great with hot tub. The property is situated where you can’t here any noise but a little walk and you are into all of the hustle and bustle of the town. Plenty of eating places and lots of intertainment if you want it.